Mavala is a nail care brand that I haven't really explored too much. I've given their nail polishes as gifts before, but have never actually treated myself to them until recently. After finding out that your Debenhams rewards can expire (who knew?) I popped in to my local to hunt down the cheapest items. Mavala polishes come in at £4.00 each in a 4ml bottle, so I decided to pick up two and use my £5 reward. One of the shades that caught my eye was "Nice." I've seen many a post about Chanel's famous "Holiday" polish and as I'm quite adamant about not spending such a ridiculous amount of money on one nail colour, this was the perfect alternative. 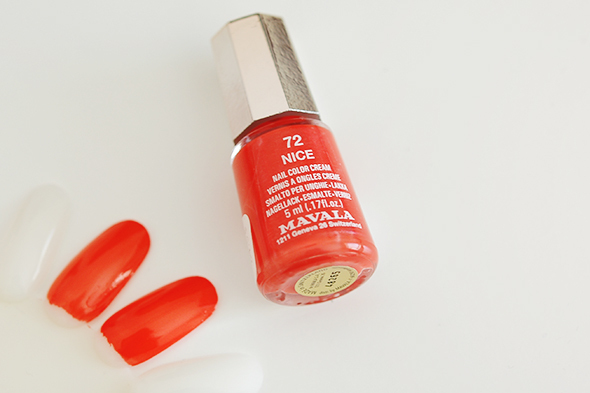 "Nice" is a bright red-orange that really stands out on the nails. It's the perfect summer colour and one that I would definitely take on holiday with me. The formula of this really makes it a winner. It can easily be a one coater and dries quickly, ideal for those paint-your-nails-and-go days, and the glossy finish means there's no need for a top coat unless you want to prevent chipping. While the size of the bottle is small, they won't break the bank if you're picking one up every now and again. Have you tried any Mavala polishes? What colours would you recommend?